But maybe it shouldn't surprise you, either. The Springville High School senior, who began the season at No. 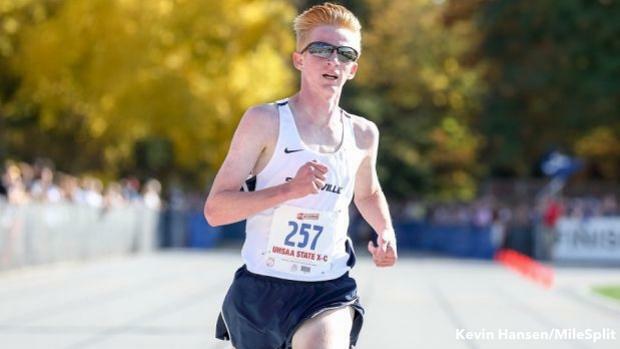 14 on the preseason MileSplit50 and won the varsity 3-mile section of the Murray Invitational on Saturday in 14:53.00, has set some major goals this fall as Utah's top returner. "I want to get the state record in cross country," Gardner said of Casey Clinger's record of 14:42.90, which was set in 2016 at Sugar House Park in Salt Lake City. "I think it's definitely doable. I'm in way better shape than I was in year last already." But no doubt, there will be just a tad more pressure on Gardner in 2018. Not only is he coming off two straight seasons of runner-up performances in Utah's Class 5A classification, but he's also following two Utah athletes who went on to win Nike Cross Nationals outside the state. The natural thought would be that Gardner, following in the footsteps of Aidan Troutner and Casey Clinger, could do the same. But, naturally, it's harder than it looks. It's probably why Gardner is holding himself more accountable in his final cross country season. He can't be the same sit-and-kick runner he's always been. Easy races have to be "grinds" toward the finish as he learns a little bit more of what he's capable of each race. The invitational at Murray was a good example of that. "My goal today was to grind from the start and keep up the hard pace," he said. "I've been known to sit and kick a lot. I want to change that this season." On Saturday, Gardner wore heavier flats to test his mental attitude toward the race. He said there wasn't as much spring to his step and "mentally, I just went out there and got it done." The veteran is still logging some of his tougher mileage and ahead of Murray even logged a tough workout. Looking ahead, Gardner will compete at the BYU Autumn Classic on Sept. 15. The course in Provo consists of three 1-mile loops on a long, pristinely kept golf course. It's there where Gardner hopes to really get after it. "It should be one of the fastest of the season," he said. Saying that, it's just another step in a finely tuned process toward his goals. As races turn into major successes, Gardner will eventually start to check-off goals in his long-term plan. "I'm just going to sharpen that blade," he said. "When it gets to state, I'll be able to do it. Obviously, I want to go and win regionals, go win nationals. Those are my goals." But first, it might start with a grind. "My training is on part with everyone else," he said. "I'm training really smart now. I'm doing all the little things."